There are three ways for you to travel to reach the city centre of Kuala Lumpur from Kuala Lumpur Airport (KUL). The first and most efficient method is traveling by taxi. Kuala Lumpur airport taxis operate on a fixed fare system, so will cost 15.60€ (RM74.30) and will take around 50 minutes to reach the centre in normal traffic. Alternatively, the KLIA Express or Transit metro trains run from the airport, both taking you to the KL Sentral station in the city. The Express, being the better option, will take around 28 minutes with a cost of 7.40€ (RM35) per person/one way. Finally, the "Airport Bus Coach Service" runs from the airport to KL Sentral station, taking around 1 hour to reach the centre, with a cost of 2.10€ (RM10). The metro in Kuala Lumpur offers two trains that will take you into the city centre: the KLIA Express and the KLIA Transit. The trains will go to both terminals on the route. The express train is the best method, as it will take you directly into the city centre, whereas the KLIA Transit will make stops at Salak Tinggi, Putrajaya, Bandar Tasik and Selatan. The express is much quicker, taking only 28 minutes to the station. Unfortunately, both trains only go to the KL Sentral station. Therefore, you will need to take an additional train to get to the city centre (area of Petronas Towers). 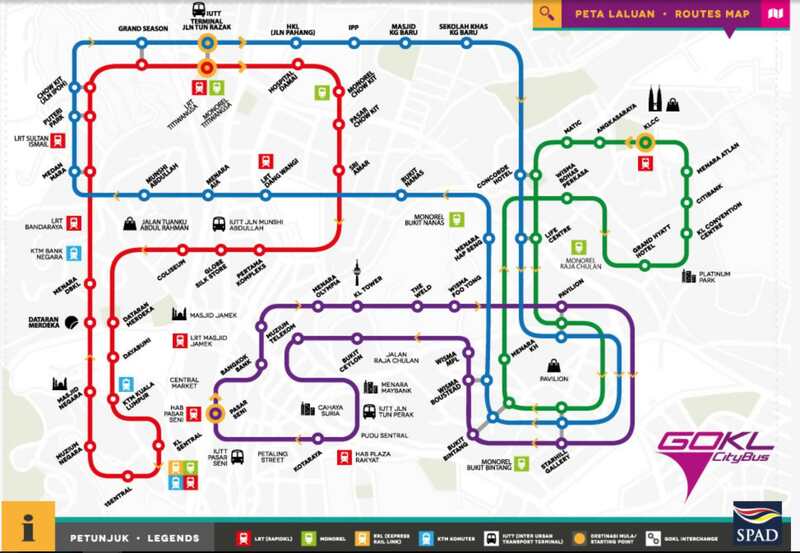 To get to this area take the LRT Kelana Jaya Line (number 5) to stop KLCC which will take around 15 minutes more. How much is the metro from Kuala Lumpur Airport to city centre? The cost for the KLIA Express and Transit is 7.40 € (RM35) per person, one way. The ticket counter is available on the platform for purchasing of the ticket for this journey. The fares for the second metro ride are paid by token from the vending machines in the station, and the cost will be 0.50€ (RM2.50). The metro is available from the airport between 05:00am - 12:30am everyday, leaving every 15 minutes. Take the metro from the arrivals terminal – follow the signage to the platform provided. 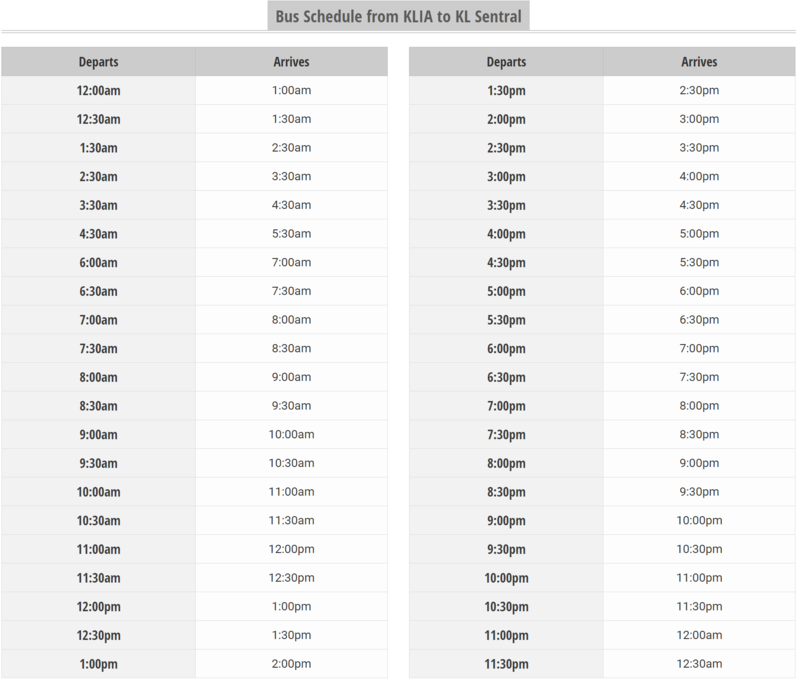 Note that the KLIA trains stop at both KLIA 1 and KLIA 2. Although a slightly cheaper trip than a taxi, the metro is not a convenient option for those staying in the city centre, as all transportation goes through the KL Sentral station and therefore requires another transfer via additional metro, which can be a hassle with luggage and will take much longer. The trains have the advantage of avoiding the rush hour traffic but can still be busy. Avoid the stress by taking the metro outside of peak hours. Beware that the running hours of MRT differs between stations. The TnGo card is much more convenient as it is accepted on multiple methods of transport and is rechargeable. You are charged as you scan in and scan out based on the total distance travelled on the metro. Kuala Lumpur airport provides taxis 24/7 that will take you to the city centre and the ride will take just under an hour in normal traffic. There are two 'bands' of taxis operating in KL, one being red and white (standard or 'budget') and the other being blue or yellow ('executive'). They should appear with a sign above the cab that reads 'teski'. Kuala Lumpur airport taxis should also be metered and licenced so make sure that you do not enter any taxi that refuses to turn on its meter. Taxis can either be metered or you can purchase a coupon from a counter with a set cost; note that this can be higher than a metered fare dependent on weather, time of day or distance. Generally, if you are to get a taxi from the airport you will be asked to purchase a taxi coupon from the Transport Desk near the arrivals terminal. Here, you will state your destination to the staff and you will be given a set price for the journey which you will then present to your driver. Always ensure you have cash. If you decide to take a metered taxi, the price can be more or less dependent on traffic, but always ensure the meter is on. A coupon price for the taxi to Kuala Lumpur City Centre (KLCC) should be no more than 15.60€ (RM74.30). Be aware that taxis taken in the hours between 12:00am - 06:00am may incur an extra 50% charged to the fare. Taxis provide the quickest and most efficient method of transport into the city centre as they will take you door to door. They are also very efficient for those with luggage and they operate 24/7. It is best to purchase a coupon to know the cost in advance. The standard sized taxis are not large in terms of storage space. If you have a lot of luggage you are better to take one of the larger mini-vans for your journey as most drivers will not allow bags in the cab area. Do not accept a set price from a driver who does not turn his meter on as this is often a much higher price than usual. Only accept a set cost when it is purchased via a coupon at an official transport desk. Make sure that all taxis you use have a licence and meter displayed inside the cab. If you feel more relaxed knowing that somebody is waiting for you, you may as well book a Welcome Pickups transfer. As soon as you arrive at the airport you will be greeted by your driver. He will be waiting for you at the terminal of your arrival with a sign that has your name on it. Your driver will help you out with your luggage and together you will make your way to the vehicle. While he is driving you to your accommodation, the driver can give you some tips and recommendations on what to do during your holidays in Kuala lumpur. Our drivers are hand-picked and speak fluent English. No need to worry about miscommunication issues that you may face with the local taxi drivers regarding your destination. Relax and enjoy your ride. If you wish to take the bus from the airport, KLIA (both terminals) provides an Airport Coach Service. Again, unfortunately the bus will only go to KL Sentral, so additional transit is required via metro or bus. The airport bus provides a comfortable and cheap transit to the city; however, it is affected by traffic, therefore, the journey can be long, often taking over an hour to reach the city. You will need to take an additional train to get to the city centre (area of Petronas Towers) as the bus only goes to KL Sentral. To get to the city centre, take the LRT Kelana Jaya Line (number 5) from KL Sentral to stop KLCC which will take around 15 minutes more. How much does the bus from Kuala Lumpur Airport to city centre cost? The bus service costs 2.10€ (RM10) one way per person. Tickets are available from the Transportation Hub (area where the bus leaves from) on the ground floor of the main terminal building – only around a 3-minute walk from the arrivals area. Tickets for the airport bus are purchased from counter no.3. The fares for the metro are available in two forms for the onward journey from KL Sentral. If you wish to pay with cash you will need to purchase a token from the vending machines in the station and the cost will be 0.50€ (RM2.50). The bus is available from 06:00am - 12:30am, leaving every 1 hour / 1.5 hour. Bus is taken from the KLIA Bus Station, ground floor of the main terminal building, only 3-minutes’ walk from the arrivals hall exit. Follow the signage for the “Transportation Hub”. Much like the metro, the bus does not go to the city centre but stops in KL Sentral, requiring additional transport to get you to your final destination. For those with luggage, this is not only time consuming but hard to maneuver with bags and groups. Hiring a taxi is much more efficient. There is also the option to take the monorail from KL Sentral to reach the city centre; however, this will take just as long as you need to walk to the Monorail Station within KL Sentral, and alight at Bukit Nanas and walk from here to the towers. Taking a taxi from KL Sentral will also operate on a fixed price coupon basis, if this is a preferred option. Trains are often a preferred method of public transport due to their ability to avoid the traffic, which can be heavy. The Go KL City Bus is available for free transport to limited destinations around the city between 06:00am - 11:00pm. How much is a taxi from Kuala Lumpur Airport (KUL) to city centre? KUL Taxis are available in set costs from the airport. The journey will cost 15.60€ (RM74.30) by the coupon method to get you into the city centre. Note that if you take a metered taxi, or an after hours ride, this price can change. How far is Kuala Lumpur (KUL) Airport to city centre? Kuala Lumpur airport is located approximately 55km from the city centre. A taxi on this route is likely to take around 50 minutes to reach the city centre, in normal traffic. How many transfer options are there from Kuala Lumpur (KUL) Airport to city centre? There are three transfer options; taxi, bus and metro. Unfortunately with the public transport you will be needing an additional trip from the end of the route of both train and metro, KL Sentral. Therefore, a taxi is the only direct method.